Alex is now 9 years old! Her birthday was on Wednesday the 28th. Most of last week was spent playing with new Christmas toys and having parties for Alex. 'Tis the season. Life won't get back to normal until Monday. Alex and I did Owl's Head (17 miles with the bushwhack) yesterday. That trip report will be up on Tuesday, January 3. That's it for now -- Happy New Year's Eve, everyone! This week, we crossed off number 66, roasting chestnuts o'er an open fire. ...then we piled the nuts into a roaster and stuck them into the fireplace. One isn't supposed to put the nuts directly into the flames, but I got tired of holding the roaster and succumbed to laziness. Every 5 minutes, I'd lift the roaster and shake the nuts around a bit. After 25 minutes, I took them out and poured them into a bowl to cool off. Some of the nuts had indeed popped and charred, but most of them survived. We got to work peeling them as soon as they were cool enough to handle. After peeling the nuts, we proceeded to eat them enthusiastically. They were good! Word to the wise, though -- chestnuts aren't very tasty cold, so eat them while they're warm. Some folks put salt, sugar, or butter on them, but plain is good too (we like them right out of the shell, with nothing added). Moving on to this week's progress on the 100 Best Kids and Family Movies List...we saw Matilda, The Muppet Movie (original version) and all three listed Harry Potter Movies. Matilda -- we loved it. The movie is faithful to the wonderfully dark and twisted book by Roald Dahl. 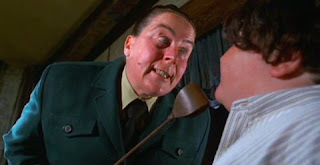 The main meanie of the story, Miss Trunchbull, is perfectly played by Pam Ferris (who, by the way, also plays Harry Potter's Aunt Marge in Harry Potter and the Prisoner of Azkaban). Ferris' Trunchbull is big, loud, and downright nasty. She's the perfect antagonist, guaranteed to make small children unfamiliar with the story cry. A lot. Doesn't get much worse than the Trunchbull. If you haven't already read the book, and if your child is the super-sensitive type, then you might want to preview this before you let your youngest ones watch it. 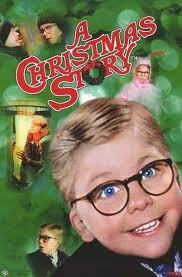 Don't get me wrong, it's a great film (we give it three out of three thumbs) -- it's just not exactly light or fluffy. 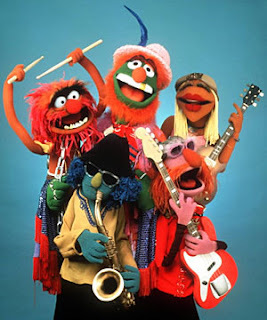 The Muppet Movie (1979)-- we loved this one too (another three out of three thumbs). Small-town frog travels far to make it big in Hollywood, makes a lot of colorful friends along the way. Great music, silly jokes, and a zillion 1970s movie stars. Seriously, how can anyone NOT like the Muppets? The girls and I have read all the Harry Potter books, therefore we've always enjoyed the movies. That being said, I've no idea how anyone who isn't already familiar with the text can possibly understand what's going on in the films. That's no one's fault; the movies can't include every single detail of the stories, bits and pieces of the book have to be left out or the films would each be eight hours long. In any event, we agree that these three Harry Potter films are the best of the bunch, and we enjoyed them tremendously. That's it for today. I'll post a Friday Wrap late tomorrow evening, provided we get out of the woods before Saturday morning (we're hiking tomorrow...it'll be a long and difficult trek, so wish us well). 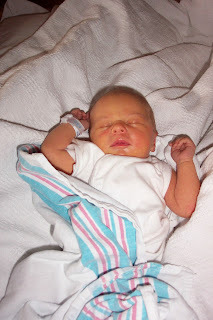 This morning, at exactly 4:00 a.m. EST, my oldest munchkin turned nine years old. Livermore Trail, Scaur Ridge Trail, Pine Bend Brook Trail, Mt. Tripyramid Trail. 12.1 miles roundtrip, 3000 feet elevation gain. And the race is on! December 22 marked the first day of the 2011-2012 calendar winter season. Alex and I hope to finish the "winter 4Ks" before March 20; this means ascending 22 mountains in 12 1/2 weeks. Our first peaks of the season were North and Middle Tripyramid. Unfortunately, New Hampshire has not yet seen a lot of snowfall; the trails were just as bare today as they were a month and a half ago, when Sage finished her all-season NH48 in early November. Since the days are now at their shortest, we set off at sunrise. The path follows cross-country ski trails, then the almost-flat Livermore Trail, for a little over three miles. ...before hiking up to the ridge. Our previously swift progress now slowed to a crawl. Or, rather, a repetitive backward slide. 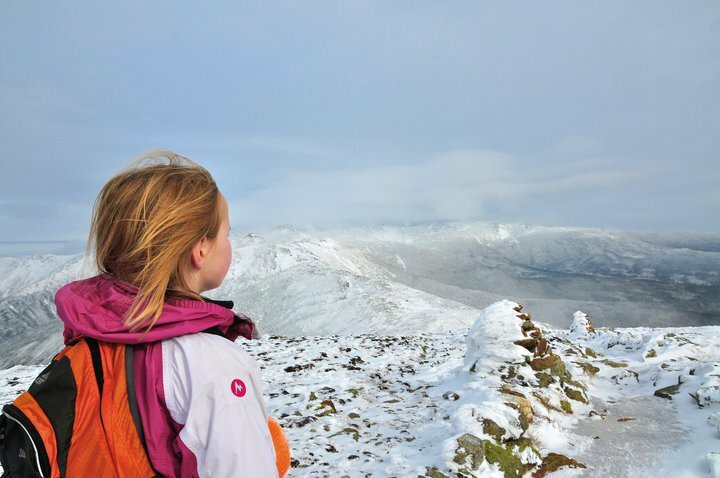 Eventually, Sage reminded me that we did, in fact, have microspikes and Hillsounds (a slightly smaller version of normal crampons), and that it might be wise to actually put that gear on our feet instead of giving it a free ride in my backpack. I listened to my wise youngster and brought the ascent to a deliberate halt so we could don some 'spikes. Life immediately became much easier. We zoomed over and past North Tripyramid and continued to Middle Tripyramid. ...and from the nearby viewpoint. After a wee bit of lounging, we headed back to North Tripyramid, where we did a whole lot of lounging. We sat and ate chocolate until Max let us know it was time to go by staring at us and shivering. By the time we returned to the trailhead, it was almost sunset. 28 down, 20 to go. Happy Winter, everyone. Hope everyone has a great holiday! We'll be back in a couple of days with updates. Peace to you and yours. The girls and I hiked the Tripyramids yesterday to both kick off our winter hiking season and celebrate my birthday (I'm now 41). I brought a cake, party hats, and tablecloth to the North summit; we had a good time. Last night, we roasted chestnuts o'er an open fire (one of the Things from our Thursday Thing list). Reports on these adventures will soon follow...but perhaps not tonight. Alex turns nine years old on the 28th, and we're having a party for her this afternoon. Much to do and very little time to do it. Gotta run...more later. Like to hike? Like to eat cheeseburgers? Why not combine the two passions and take part in Summit Cheeseburger? Summit Cheeseburger's mission is "to eat a cheeseburger on every summit on earth – not completed by any one person – but rather through the collective effort of hikers around the world. 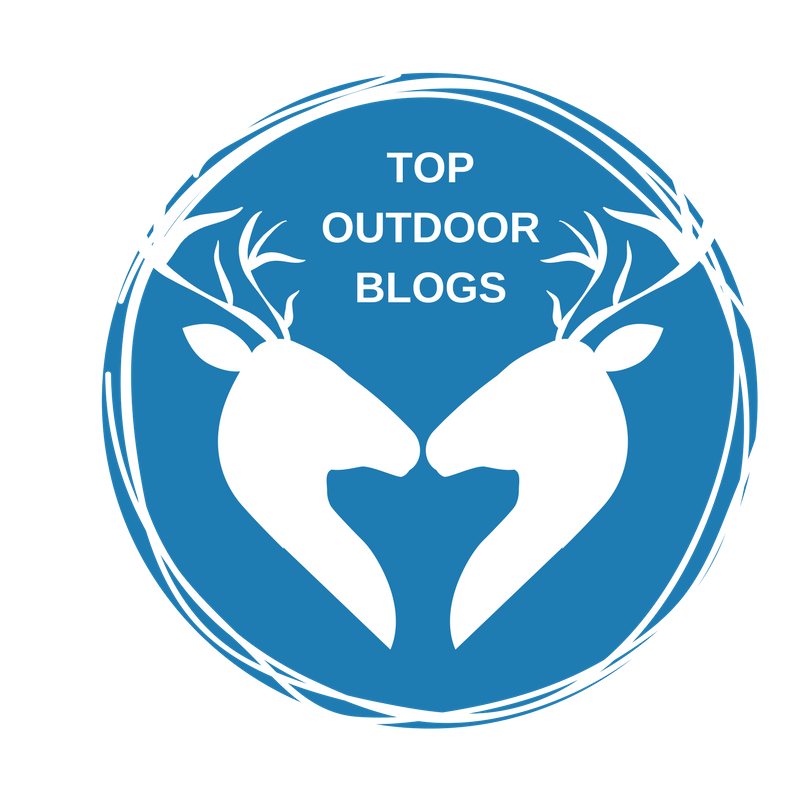 If every visitor to the web site would just eat a few burgers on a few peaks, from the top of Mt. Everest to the smallest bump, this enormous and important task might be completed in our lifetimes." 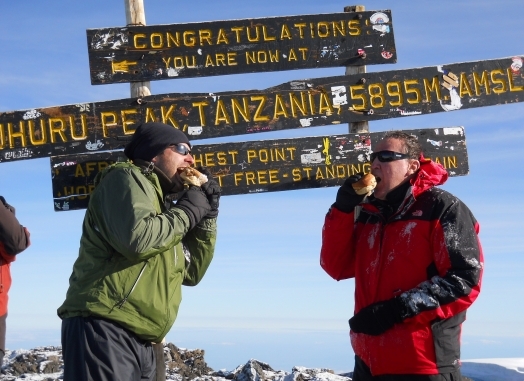 Two hikers, "Kilimanjaro" and Tony, eat cheeseburgers on Kilimanjaro's summit. Photograph copied from Kilimanjaro's trip report, ﻿http://summitcheeseburger.com/node/473. Fun stuff. Hope to do our part sometime soon. No Monday Muse or Tuesday Trip Report this week -- I'm taking today and tomorrow off to finish some book business and to prepare for the winter hiking season. The next few months will be extremely busy and slightly nuts (in a good way). Alex and I will attempt to summit 22 mountains within a 12 week period -- none of those peaks will be easy, we've only the most difficult winter 4Ks left. Sage will join us when she wants to, but, for the most part, it'll just be me and Alex. Sage has no current interest in taking on all of the winter NH4Ks. UP hits the shelves April 3, therefore, the last few weeks of official winter will be filled not only with full-speed-ahead winter peakbagging, but also with publicity and marketing events. We're going to have a very enjoyable March. :) Life is good. Alex on Eisenhower, January 2011. Photograph by Clay Dingman. Alex and I are as ready as we can be for the upcoming winter hiking season. We intend to finish our remaining 22 peaks by March 20. Our first winter hike of the year will be on Thursday, December 22nd; we'll have our boots on the trail a couple of hours after the official solstice. Galleys of UP have been sent to reviewers and media nationwide. So far, there's been a healthy amount of preliminary interest from some major players. Also...I'm giving a galley away to the first person who sends me an email with "UP" in the title after my Facebook "likes" reach 2500. So please continue to spread the word -- thanks! 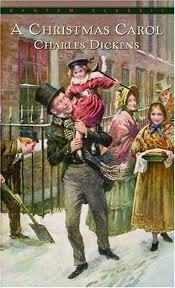 'Tis the season for giving to charity; many of us will soon make end-of-the-year contributions to various organizations. I recently came across this informative and helpful review site and plan to use it when deciding where to send my donations. Perhaps it might be of use to you as well. Drakes Brook Trail, Sandwich Mountain Trail. 8.6 roundtrip miles. Sandwich Dome -- our last "small" mountain until late March 2012; Alex and I will soon resume our winter 4K quest. Next week, she and I (and Sage, if she says she wants to), will hike a 5000 ft Trailwrights peak in an effort to ready ourselves for the fast approaching winter hiking season. Therefore, with Sandwich Dome, we bid a temporary farewell to mountains of short stature. Not that Sandwich Dome is really all that short; at 3980 feet, it's almost a Four Thousand Footer. Still, Drakes Brook Trail is flat with only a few moderate pitches, which makes for a fairly easy hike. The morning was bright and sunny, but the air was cold! We speedwalked the 0.4 miles to the intersection with the cross-country ski trails. From here, it was an easy to moderate 2.8 mile walk to the intersection with Sandwich Mountain Trail. But first....the water crossing! The crossing doesn't look all that bad in the picture. And, truth be told, it wasn't...except for one small bit that was fairly deep and not at all convenient. Sage, Max and I made it across without much trouble, but Alex slipped on a bit of ice and dunked her entire boot into the freezing cold water. The next few tenths of a mile were spent experimenting with different ways to keep Alex's left foot warm and dry. What worked best was removing the soaking wet liner from her Sorels, wrapping her bare foot in a hiking towel and plastic bag, then sticking her towel-bag-foot back into the linerless boot. Alex comfortably hiked all day like this; I'll have to remember this tactic if/when we're ever again confronted with an episode of accidental dunking. Up we went, along the (barely) snow-covered trails. ...before hiking another 1.3 miles to the summit. It was cold up there (! ), so we didn't stay long. A few bites of chocolate and down we went. We returned to the trailhead without much ado; thankfully, no one fell in the water on the way back. Before getting into the car, the girls burst into a manic moment of goofiness. 'Twas, as always, a good walk in the woods. Have to say, though, the lack of snow is remarkable. It's mid-December, but the trails seem to think it's late October. Wonder if the precip will ever come down.